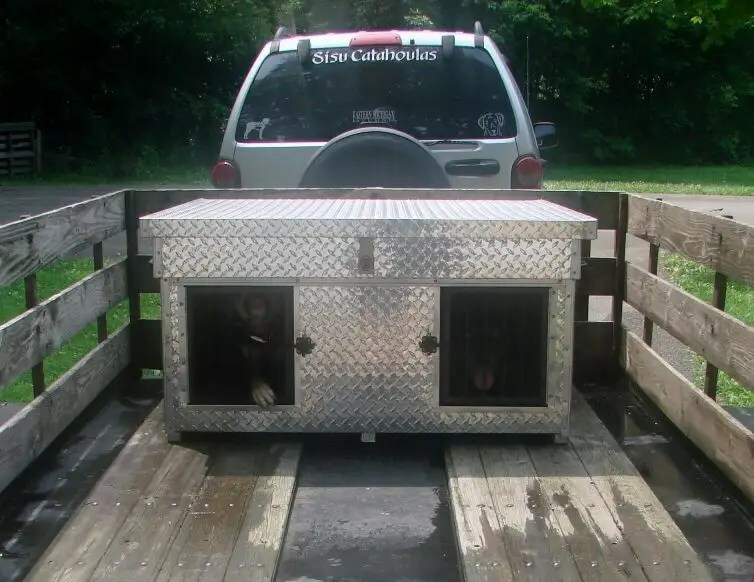 I’d originally planned to get a smooth-skinned aluminum dog box without top storage, but was concerned about it being large enough for my dogs as it was designed for bird dogs. I found this for the same price as the other box instead. It has lockable top storage, lots of ventilation, insulation (cooler in the summer, warmer in the winter) and, being aluminum, won’t rust. The only real complaint is that I can’t put my stickers on the diamond plate. I’m working on fixing up the trailer I bought last year so that I can use it when I travel with the dogs. Currently I’m getting about 20 mpg with the OD off (as leaving the OD on while towing isn’t good for the transmission), so I’m going to attempt to remove/redo the sides on my trailer to make it a bit lighter. I’m also working on a frame to help hold everything in place while it’s on the trailer. I’ll still strap things down, but a small frame will help keep the things like the cooler, water tanks, truck box, and the dog box in one place.